While 1031 exchange property was once pretty broadly defined, recent changes to the law now restrict them to real property. In this episode, David Moore explains the changes and has some cautions for 1031 exchange investors. David, what are some of the top 1031 exchange property restrictions? David Moore: As we discussed previously, we had a change as of the 1st of the year with tax reform. It went from any property held in productive use, trade, business, or for investment to any real property. That one change has really narrowed our scope to just tangible, real property in today’s world. When we’re talking about real property, the defining factor is that it’s something to be held for investment, productive use in trade, business, or for investment. But there are things that fall through the cracks. Let’s say it’s dealer property that’s held for a shorter period of time, or maybe it’s second homes. We actually have rules for second home exchanges, too, a little bit more restrictive than we’re talking about with pure investment, but we do have guidelines. For those people that say, “You can’t do an exchange of a second home,” they’re wrong. You can. There’s just a separate set of rules for it. 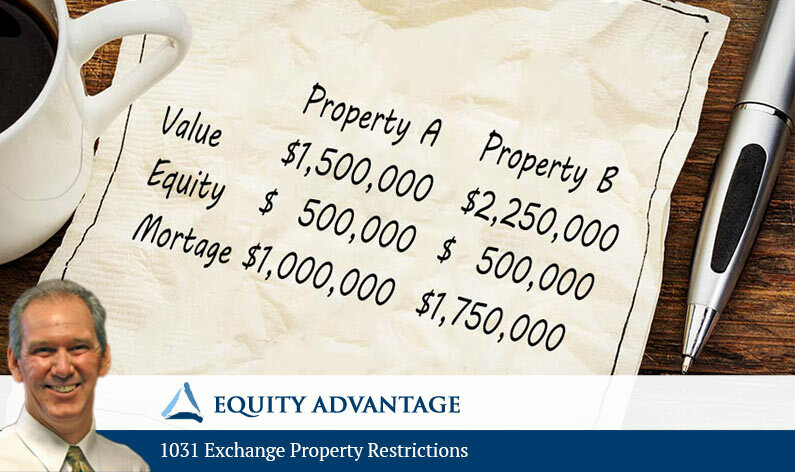 What cautions do you have about 1031 exchange property? David Moore: I think the biggest caution I’ve always had is timing. You have to make sure that you’re planning ahead and taking the time necessary to find what you want, especially in this market. Time is a common factor and a common problem, whether we’re talking a 45-day ID period, a 180-day time to complete the transaction. Whether we’re talking about converting a property from investment to residence, residence to investment, or whether you’re talking about flipping properties. All these are time issues that can come out and bite you if you’re not careful. We’re always looking at time, and whether we’re talking about time constraints for the exchange or time constraints to make a property qualify, time is a big factor. Once again, we’re going to look at things and say, “Okay, time isn’t the factor.” Intent is probably the biggest issue when you’re looking at holding periods, but time’s going to fit into it. How long is long enough? Thank you, David. Listeners may call (503) 635-1031, or can visit 1031exchange.com for more information. One of David’s favorite sayings is that the only dumb question “is the one you don’t ask”. Things are changing with 1031 exchanges and you simply cannot afford to be wrong. Give them a call today to get up to date!